The STORE&GO project was launched on 1 March 2016, with a 48-month duration. In order for the European Union (EU) to meet the assigned target of reducing CO2 emissions by at least 40 per cent by 2030 compared to 1990 and by 80–95 per cent by the year 2050, the majority of fossil and nuclear energy must be replaced with renewable energy. As renewable sources tend to be volatile and generate energy intermittently, long-term storage is required. 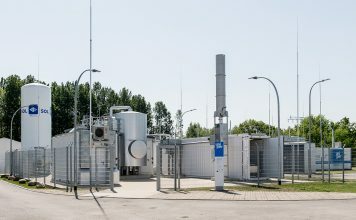 An EU Horizon 2020 Research and Innovation programme project coordinated by the DVGW Research Centre at Engler-Bunte-Institute, Germany, is striving to integrate power-to-gas (PtG) technology into Europe’s future energy system. 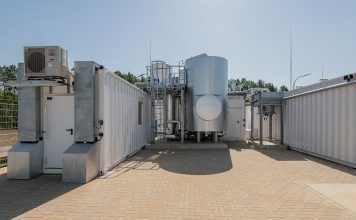 The project, ‘Innovative Large Scale Energy STORagE Technologies & Power-to-Gas Concepts after Optimisation’ (STORE&GO), involves the demonstration of three different PtG concepts in: Falkenhagen, Germany; Solothurn, Switzerland; and Troia, Italy. The work builds on previous research that has demonstrated the technical feasibility of PtG technologies, and seeks to further enhance the technology’s ability in order that it can be integrated into the daily operation of European energy grids. The project is led by Dr Frank Graf and involves the participation of 27 partner organisations and companies from across Europe, specifically Austria, France, Germany, Italy, the Netherlands and Switzerland. 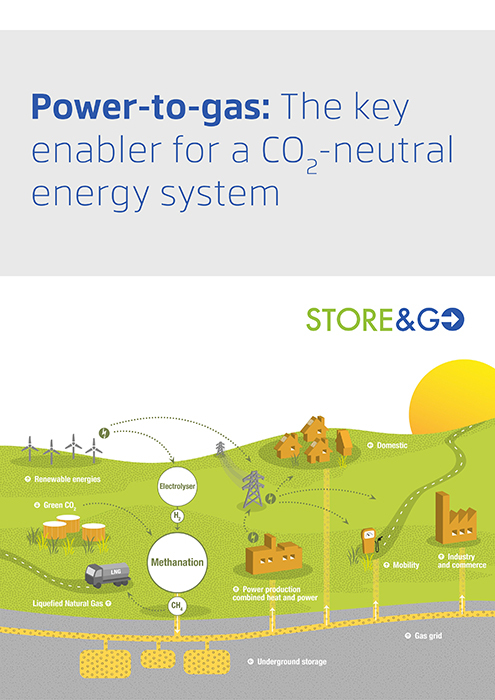 The STORE&GO consortium benefits from the involvement of large industrial players, innovative small companies, and research institutes with a focus on reactor concepts, electricity grids, techno-economical studies, business development and law. These partners provide the experience and knowledge necessary to ensure that STORE&GO’s activities result in real-world change. Each of the three concepts being demonstrated in STORE&GO involves novel methanation technologies, and each has been adapted for the respective demonstration site. These PtG plants will be integrated into the power, heat and gas grids for further transport and integration. The idea is that this will enable the researchers to feed renewable methane into the existing natural gas grid in a climate-neutral way without any restrictions, which means it can be made available for a wide range of customer applications. 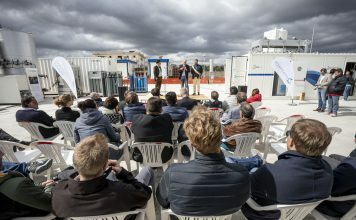 The demo sites provide highly diverse testbeds: different climates; grid types and topologies, like transmission or distribution; different combination of solar, wind and hydro energy; and different CO2 sources, including bioethanol, waste water and directly from air. This way, the project can analyse and compare the advantages of PtG in various environments. Two of the sites use thermo-catalytic methanation, with reactors designed specifically to improve the heat management of the exothermic methanation reaction that is needed to ensure high conversion rates of hydrogen and CO2 to methane. In addition, the researchers expect that these reactors will have constructive advantages that will result in cost reductions. At the third site, a biological methanation reactor is used. This involves microorganisms called Archaea breathing in hydrogen and CO2 and exhaling methane. The team hopes to accelerate market uptake by identifying business models; creating a European PtG map displaying the most promising locations to install facilities; and developing a European PtG roadmap that contains recommendations regarding which applications PtG may serve in the short-, mid- and long-term. 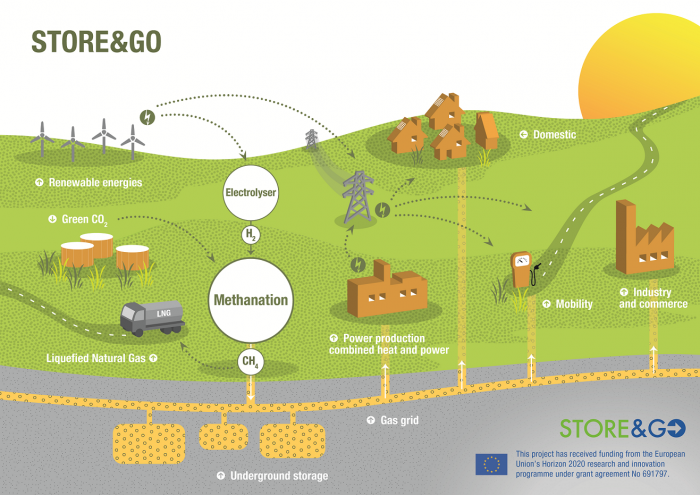 The team hopes that the STORE&GO project will benefit end users across Europe by ensuring a sustainable supply of energy and therefore guaranteeing security. Furthermore, the gas generated by PtG can replace fossil gas in any application, like heating and transport. It thus helps to free the heating and transport sector from fossil CO2 emissions.